I want to try and document all I can about dance bands of the 1920s & 1930s, especially British ones, even though the interest in the music seems to be fading. I would be very grateful for any information and especially scanned photographs which I can publish here. I can give you acknowledgments or you can remain anonymous as you please. Don't hesitate to tell me my mistakes either. I can take it! You may e-mail me by clicking here. I've been collecting dance music on 78s since 1970, when I was a mere 12 year old, along with my cousin, Charles Hippisley-Cox (who is a year younger than I). Our parents hoped it was just a phase we were going through, as they saw the bedroom floors of our respective homes bowing with the weight. I now have about 13,000 records* and it is still growing..... Charles and I may be seen at the Birmingham Record fair at the National Motorcycle Museum, both trying to sell records and buy 'em. *A rough count undertaken on November 25th, 2001: About 12,500 dance & jazz records & 500 ragtime / early popular vocal 78s. One of my other main interests is Genealogy. I am documenting my family tree in another section of my web site. Click here to return to my front page and visit the Genealogy section if you're interested. What Dance Music Is This Web Site About? This web site is concerned with the dance music that was prevalent between the two world wars in the 20th century. To start with, it was very much of a ragtime style, played generally by a small orchestra, the instruments would depend on the location. It could have included cornets, trombones, horns, clarinets, flutes, tubas and drums and maybe strings, or it could have been a trio playing in a tea-shop. On record, the larger orchestra is generally heard, with exceptions. The exceptions are the likes of The Original Dixieland Jazz Band, making their recording debut in 1917, consisting of cornet, trombone, clarinet, piano & drums. There were banjo quartets consisting of two banjos, piano & drums. Some other trios of saxophone, piano and xylophone. Also novelty groups, such as the Six Brown Brothers, all playing various saxophones. Anything went, really. But then in 1920, Paul Whiteman in America asked his friend and colleague, Ferde Grofe, to try and get it down on paper for an orchestra. He set the standard, really; Whiteman's orchestra consisted of 2 trumpets, trombone, 3 saxes, violin, piano, banjo, tuba and drums. This became the normal orchestration for a dance band or orchestra for the next twenty years! The saxophone and banjo came to signify the music of this period. The acoustic recording methods being used required the more percussive and up-front sound of the banjo and tuba, but once electrical recording (generally introduced in 1925-6) became established, the banjo made way for the guitar; the tuba for the double bass. Interestingly, some photographs of dance bands in the early 1920s show the use of the double bass & guitar, but the acoustic horn couldn't record either of them very well. Most dance bands were quite small, probably 6 to 8 pieces, in the early 1920s, but gradually they grew, especially the show bands like Whiteman's, which was about 30 strong by 1928!. In England, Jack Hylton was Whiteman's counterpart, though it wasn't until the end of the 1930s that his band was this huge. In the mid-1930s, America was taken over by Swing Music (like "dance music", this is another term that has recently been hijacked for a kind of modern pop music). This was played 4-in-a-bar rather than 2. It was exciting and different and appealed to the young. The bands were usually 14 or 15 piece and revolved around the bandleader, who was a top-player of his instrument. The names of Benny Goodman, Artie Shaw, Tommy Dorsey, Bunny Berigan, Harry James, Woody Herman all come to mind. The music was either instrumental, the tune revolving around a couple of riffs (repeated musical phrases) or reviving an old tune of about 10 years previous, or they were "pop" songs of the day, played rather slow and sensuously. The style got into a rut rather quickly, the songs were always played at the same speed, the arrangements were minimal, revolving as I said, around the playing of the bandleader. The instrumentals became a bit "samey" too; there are only so many riffs and only so many ways to play them. The style survived, though, through the war and generally evolved into a "Big Band" style using a big 20+-piece orchestra. In England, bands never really took to swing and the British music papers gave it the thumbs-down for being all the same. English dance music became more sophisticated in its arrangements and the vocalist became more important during the later 1930s. The war helped this along, as those vocalists, such as Vera Lynn & Denny Dennis, toured the country (and abroad), boosting the morale of the troops. It was relatively easy for one entertainer to tour, and use local musicians as accompaniment, compared to trying to move a big orchestra around. After the war, dance music gradually faded as the singers took over the popular music scene. As usual, there were exceptions, like Ted Heath's big band, but most other bands slipped into an accompanying role. In America, it wasn't all swing, though the alternative was often even more set in its ways. The so-called "Mickey-Mouse" bands, using a novelty technique in every record which soon became tiresome. Shep Fields blowing bubbles in a glass of water, for instance. Guy Lombardo, who seemed to only have one arrangement to play. There were the bands in between, so to speak, such as Freddy Martin, Vincent Lopez etc, playing quality dance music, smooth and sophisticated. They survived in one form or another right into the 1960s, but times had changed. So, on this site you will eventually find a comprehensive set of pictures and history of the record labels around in the 1920s & 1930s (with some earlier & later ones too - It's my page and I'll make my own rules!). Photographs of the bands and musicians and information about them. Please be patient, there are a lot of bands - it will take ages to bring all the information together. Being English and living in England, I will be concentrating on British bands, and I'll be grateful for any help, especially with photograph scans of recording artists. Discussion group covering anything to do with British dance bands of 1920s - 1940s. Join in. Don't be shy !! As above but for American dance bands, of course. Lively group for those interested in dance bands "down under". Are you a "fan" of Al Bowlly's singing? Then come and share your views here. Whether novice or expert, you'll find friendly advice and discussion here. Lots of stuff about bands in films too. Well worth a visit or 200 !! American site worth visiting - lots of information about British and American bands. This site was run by Murray L Pfeffer, who, sadly, passed away in 2008 and the website not longer exists. However, Doug Henkle is attempting to save some of the webpages and his site can be found here. Norman's comprehensive site about British acoutic-era record labels. Go there now! but Norman still has interesting articles about 78s, early technology and music here. Tim's in California and has some interesting stuff on his page. He has also published some books about early recording artists. An online journal about American record labels and artists of the 78 era. Also a book publisher - has published the new "Jazz Records" discography in 2002. An English site covering the early years of recording and Music Hall. now has it's own web-site. of Real Audio sound files. This German organisation is covering the gramophone and record industry in Germany. It incorporates The Phono Museum and The Lindstrom Project. The site is mostly in German, as you'd expect, but do have a look. 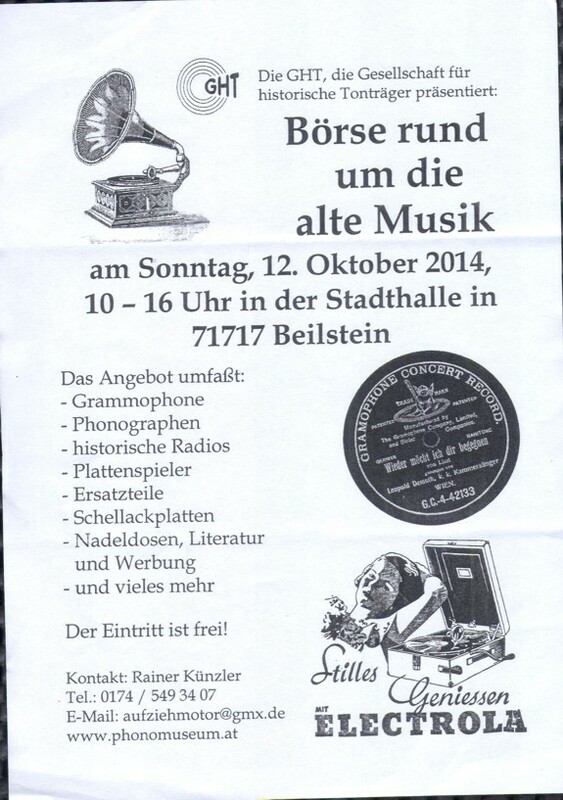 They are organising a record fair in Germany in October 2014. Click here to see the details. NOTE: All the sites where you can buy records mentioned below are genuine and reliable. I use them regularly myself and am personally acquainted with most of the people running them. Mike Dutton is at the helm producing excellent CD transfers for the Vocalion label. VJM has many record auction listings which may be to your taste. Some auctions are online. There are also many fine articles here and in the magazine as well. auctions of records. Click on his name to go there. market stall in Leicester Market on Thursdays (stall D36). Dance Band and Popular music. Formed in 2006, this band plays big band music similar to the bands of Glenn Miller and Ted Heath. It is run by David Bradford and they play in the Derbyshire and Noth Staffordshire area. Monday every month, bar bank holidays. A dance band playing the music of the 1920s & 1930s, based in the South East of England. A CD of their recordings are available too. Yorkshire district. See their site by clicking on the name above. Probably the longest established vintage orchestra, the PRO were formed in 1969. They are only orchestra I have seen live, and they are, in my opinion, excellent. been playing at The Savoy Hotel, London since 1997 and have performed before royalty! A six-piece band formed in 1983 which plays the music of the 1920s, 30s & 40s, based in North Staffordshire.